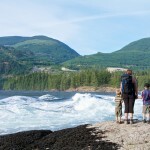 Knowing that we had set a pretty ambitious time to leave town of 10 am on Friday June 12 (hey that’s early when you have two young kids! ), we did a fair amount of packing on the Thursday night, then got up the next morning and proceeded to cram everything in… and left at the bright and early hour of 11:30 am! 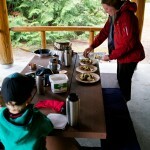 Feeling rather jammed with camping gear for a 10-day trip, we headed off to Rossland for the first stop of the day. 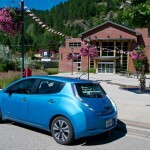 I’ve used the charger at Rossland dozens of times now and it has worked flawlessly every time, which is a wonderful vote of confidence. The vast majority of Level 2 chargers have been that way (unlike the Level 3’s so far, more to come!) 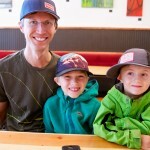 We met a friend and headed to the Alpine Grind for a shot of caffeine and some mid-morning snacks. I did one silly thing here though, we got so caught up in what we were doing that I let the car charge to 100%, even though the next part of the trip was down to Northport, 25 km away and 700 m LOWER! Doh. Anyways, Cedric and I hopped in the car for the short trip over the border to pick-up our new Open EVSE from the hardware store in Northport. We used less energy to get to Rossland and then again to Northport and back to Rossland, so we were back on the road again after a little over an hour of charging, so despite leaving 1.5 hours later than we had meant to in the morning, we had made up most of the time by the time we left Rossland for the Strawberry Pass. The trip to Grand Forks was totally smooth – we drove with the flow of traffic up the Paulson Pass, then mostly coasted and regenerated down into Christina Lake, picking up 14% of our battery (or a little under 3 kWh of energy). Totally saves on brake wear, and we got to reclaim about 20 km of flatland range from the descent! Can’t do that in a hybrid! 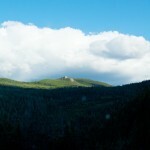 Old Glory Mtn as seen from the Paulson Summit. 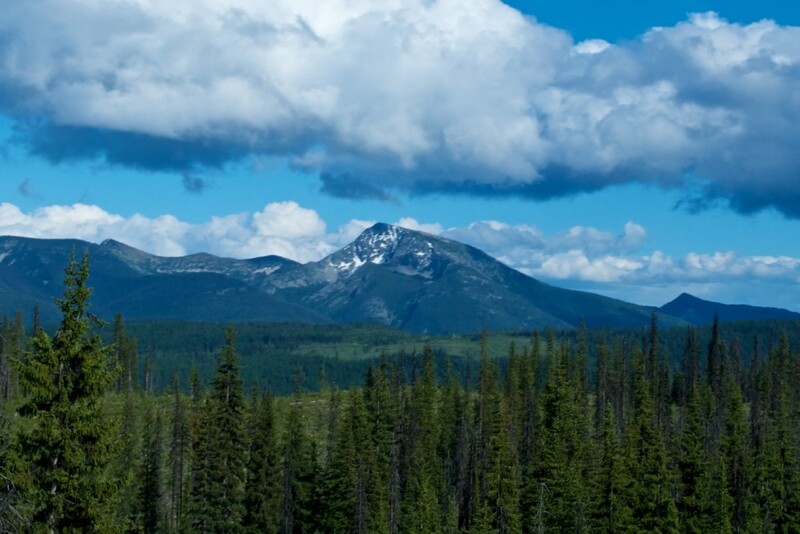 A side-trip from the internationally renowned biking trail, the Seven Summits. 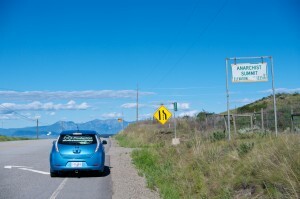 We arrived in Grand Forks having only used 51% of our battery instead of my estimated 84% – some of that came down to driving a bit slower than I thought we would, and part of it came down to the trip being 95 km instead of 105 km (I guess Google Maps is wrong sometimes!) But something was seeming fishy – every time I have done this leg of the trip I have used less energy, and I was starting to notice a pattern whenever the leg of a trip involved significant ascent and descent. Thinking about it further, I’ve come to the conclusion that my spreadsheet planner is too pessimistic on how much energy I can recover on descents – I have it set to around recovering 55% (based on some info from a forum member at mynissanleaf.com) of the energy used to climb: after looking at the data from this trip (and a more recent trip to Kelowna in late August), I’m convinced it is closer to 80%, maybe even higher. 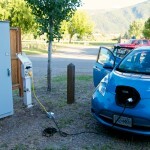 We stopped at the municipal campground and hooked up our new Open EVSE and it worked quite the treat! 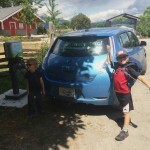 We were able to charge at the full 6.6 kW that our car is capable of, which combined with the less energy used to get to GF meant we were back on the road in less than an hour. 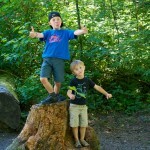 We made up a quick supper with the boys and went for a walk around the campground and surrounding park area. Really beautiful spot. 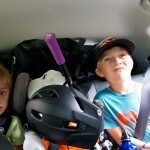 The boys badly wanted to have their bikes to ride on the BMX track right beside the campground! 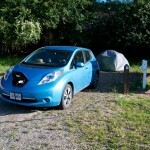 After dinner we cruised over the Eholt Summit and down to the Kettle River RV Park – they put us up in a yurt for the night with our choice of 120V/30A or 240V/50A power. 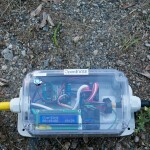 I set the unit for 20A on the 120V/30A circuit knowing it would have us topped-up by the morning. By the end of the day we had made up the 1.5 hour deficit, arriving right on planned time in at the RV park. 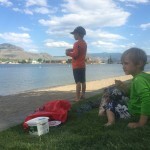 Day 2 was to take us over the Anarchist Summit to the Okanagan Valley at Osoyoos, then up the valley to Summerland, over a back road to Princeton, and on to Manning Park to camp for the night. The morning dawned crystal clear, a bit chilly, and sunny! 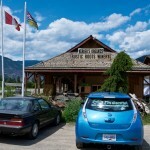 We were on the road an hour late again the next morning, but I was convinced we wouldn’t need to charge as long in Osoyoos (based on using less energy for up/down trips the day before) and that Google had to be wrong on how long it would take to get from Osoyoos to Summerland. 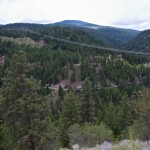 The Anarchist Summit is about 2/3 of the way from Rock Creek to Osoyoos – the scenery on this portion is spectacular and the descent into Osoyoos is pretty cool. 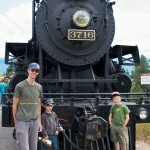 Arriving in Osoyoos, we plugged in and I phoned the train company (Kettle Valley Railway) in Summerland to confirm our tickets while Marley went out in search of a hairbrush (she had inadvertently forgotten hers in Nelson). I was casually figuring out how long I would need to charge when the woman on the phone brought me sharply back to reality – she informed me that I needed to leave RIGHT THEN if we were to get to the train on time for our ride! 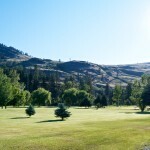 I frantically called Marley and told her to come back to the car – thankfully we had only used 31% coming into Osoyoos instead of 50% (traffic was light so we had travelled at 80 – 90 and enjoyed the scenery), and we were predicting about 85% to get to the train station in upper Summerland, so we unplugged after 20 minutes and hit the road in a bit of a panic. We got there with a few minutes to spare, then Marley took the car back down to the town to charge while the kids and I took the train for a few hours. She found an awesome craft supply store so she actually wasn’t done shopping when we called her to come back and get us! Steampunk and post-modern. 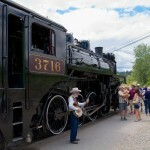 Interesting to think though that when this train would have been originally running, there were likely electric cars too, but then they took a 100 year hiatus! 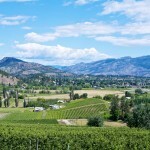 The back road to Princeton from Summerland was well maintained and a very pleasant drive through rolling hills and valleys. 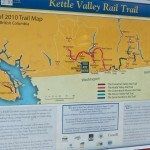 We plan to come back to this area again with our bikes to ride the Kettle Valley Rail Trail – incredibly scenic and plenty of places to camp. That ribbon of brown across the valley is the KVR line. 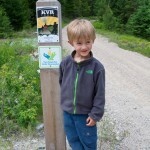 Part of the Trans Canada Trail, there are hundreds of kms of this line that have been converted to multi-use trail. One side-effect of this side-trip though was that we added a few hours to our trip. 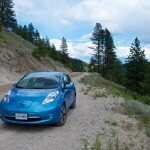 My original plan had been to head straight from Osoyoos to Princeton, but my spreadsheet was estimating 97% of battery used travelling at even 80 km/hr; it is uphill to Princeton, and fairly rolling terrain, plus it is 115 km with no 50A service campgrounds in the middle. So in the end, we decided the extra few hours to head north for a less ‘risky’ trip segment was worth it, especially when combined with the cool steam train ride and great scenery of the back road. Anyways, we arrived in Princeton at 3:30 pm, and weren’t ready to go again until we had a 100% battery, even though it is only 70% to get to Manning Park; they only have Level 1 charging (5%/hour instead of 30%/hr for Level 2), so I wanted to arrive with as much power as possible. We wandered through downtown Princeton, did some grocery shopping and headed across the river to the skate park. We had brought the scooters for the boys thinking they would use them at each charging stop, but so far they hadn’t even brought them out until Princeton. 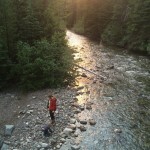 We hung around the park for an hour, then headed back along the highway on a dedicated multi-use trail over a nice new bridge and left for Manning Park at 6:45 pm. 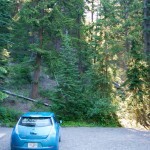 We had a beautiful evening drive up into the mountains of Manning Park, arriving at our campsite just before 8 pm. When considered in isolation, the amount of time to travel this distance seems long, but it did not feel like a long day with it broken up so many times. Travelling long-distances infrequently coupled with a curiousness to see what is in each of the small towns we travel through meant we were never bored and we were finding that we enjoyed travelling in this fashion. Cedric spent far more time talking to us or looking out the window. Plenty of corners on this section of road to keep drivers occupied and interested! Thinking we would have plenty of time to get to Vancouver (our friends we were to stay with were on the Island and wouldn’t get back until later in the evening), we decided on a lark to head to Othello Tunnels just back outside of Hope to go for a morning walk. Swinging by the Tesla Supercharger on the way to Othello, we found all the stalls empty (darn, no car sightings for [ahem] the boys). Too bad we couldn’t use them! The Tunnels were well worth the side trip and we really enjoyed the walk. 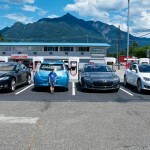 Coming back into Hope to top-up the 10% we had used, we swung by the Superchargers again and this scored seeing 3 Model S! 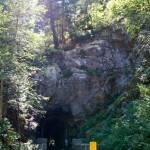 We had seen some pics from some friends of ours only a few weeks prior of them going to Othello Tunnels, which are only a few minutes drive outside of Hope. 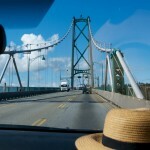 We didn’t need to be in Vancouver at any particular time, so decided to make a side trip there. But around the corner, the first tunnel! You can see right through this one, to the next open area, then through the second tunnel – this picture does not do it justice. 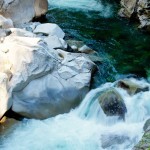 The Coquihalla River in the canyon it has carved. 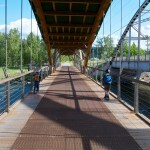 Photo taken from the first bridge. 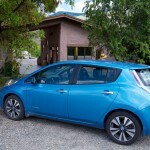 So, Marley and the kids head off to look at the animals and get some ice cream thinking I would join them in a minute and we’d be on our way in about 20 minutes… instead I spent a frustrating 45 minutes fiddling with the charger trying to get it to charge for more than 0.1 kWh of energy at a time! I had several dozen emails from Greenlots (the network provider, NOT the hardware provider) telling me that I had got 0.1 kWh of energy; one time I got 0.5 kWh. 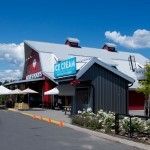 By this time Marley and the kids were back and wondering what was going on – I frustratingly explained the situation – we could have headed to another Level 2 station in Abbotsford (for some reason they didn’t install one at the Ecodairy, which seems odd to me since I would want my visitors to stay for hours, not 20 minutes, not to mention the Level 2’s are pretty much bulletproof back-up chargers), or we could eek enough juice out of this Level 3 charger to make it to the DCFC in Langley about 35 km away. We opted to head to Langley to get the DCFC experience (after confirming on PlugShare it was indeed working!) and arrived with 14% remaining – decent padding when there are so many Level 2’s around in the Vancouver area. 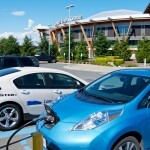 The DCFC in Langley worked as expected and we experienced a new ‘problem’, the kids were having so much fun at the playground and waterpark at the Langley Events Centre they didn’t want to leave after our half hour of charging was done! Interestingly, our battery bars had been at ‘6’ most of the journey, but after the fast charge they were right up to 8, with the ambient at about 30 celcius. By the next morning, we were back down to 6. 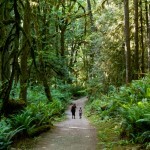 Great location for a DCFC, a short jaunt off the freeway to a spot with plenty to do for a 20 – 30 minute stop. I think they missed out though by not including a few Level 2 EVSEs, because if you go on the tour etc, you could easily spend a few hours here. 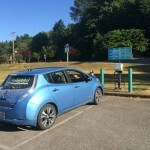 As part of the E-mazing Race, I had noticed a cluster of Level 2 Sun Country Highway (SCH) chargers in Port Moody, so we headed over the Pattullo Bridge (to avoid the tolls on the new Portman Bridge, I forgot to pre-register) and back up to Port Moody. 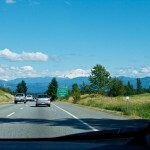 Our original plan had been to head north to Mission from Abbotsford after the DCFC at the Ecodairy and head into Port Moody on the Lougheed (Highway 7, north of the Fraser River). 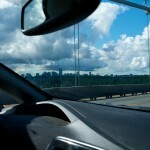 I hate driving in Vancouver! Anyways, we found a number of the stations were listed on SCH’s App, but not on PlugShare… well PlugShare ended up being correct; a number of the chargers listed on the SCH App were not publicly accessible (eg. Port Moody Public Works Yard, which I admit I had kind of expected once I saw where it was). We did pick up 40 points I think though, so not too bad. By this time it was around dinner time, so I promised to only try another 1 or 2 SCH chargers that were on the way to our friend’s house near Arbutus and Commercial, where we would stay for the night. We were foiled again at the Port Moody City Parking Lot (couldn’t find it) and at Ethical Bean Coffee on Kootenay St (come on we had to try here, see what street it was on? ), but they have a gate across the parking lot after hours! The store seems to be located in a light industrial area that I guess shuts down after everyone goes home for the day. 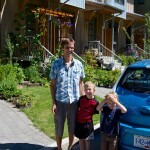 We didn’t bother to plug the car in at our friend’s house, knowing that we could easily make it to the North Vancouver DCFC on our way out of town in two days. 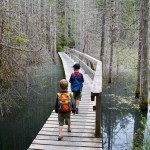 We didn’t stay here too long on Sunday – this was one of our stops for the SCH E-Mazing Race. 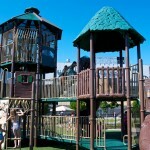 Nice spot though, good playground and waterpark right on the waterfront. Another SCH E-Mazing race stop at Kyle Center. 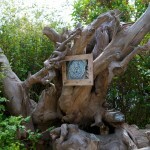 It appeared to be beside an art museum or something, but being Sunday, it wasn’t open. 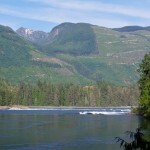 On Monday June 15th I attended the DCFC workshop sponsored by Plug-In BC as an advocate for users in the interior of the province. 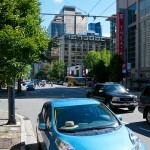 Befitting of a metro city center, I took transit to get downtown instead of clogging the roads with another car! (I should note that I think one should walk where possible, followed by biking, transit, ride-sharing, car-sharing, electric cars, and in that order.) The workshop was a great experience chock-full of information on how the current DCFC network had come about and some future plans. The meat of the workshop was to establish where there might be some gaps to fill, or future routes to add, after the current 30-station rollout is completed in 2016. Hopefully we will get a good announcement along those lines in the next several months. They were also soliciting for feedback on how the existing stations were working from a user’s perspective (though I should add that they had some impressive usage statistics gleaned from Greenlots so far) and what could be done to improve the user experience. I noted my concerns on reliability when you have only one station at a location (i.e. 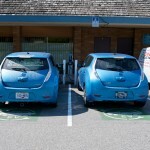 install two separate Level 3 units), how a Level 2 installed in tandem would help with this at a low cost, that “EV travel route maps” could be installed at each station. 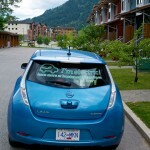 There was also some good philosophical discussion on how to further the adoption of EVs in BC and whether the DCFC Level 3 network would help to facilitate that now and in the future. I left quite hopeful that BC will soon have the best DCFC network in Canada (though Quebec is pushing hard too, see Le Circuit Electrique), and perhaps rival that of Washington or Oregon to the south of us. Feeling quite happy with the workshop, I took transit back to my friend’s house, where Marley and our kids had been playing with their kids for the day. 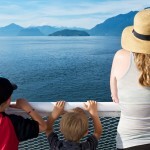 We had to pry our kids away and headed to the North Vancouver DCFC for a quick top-up and snack before zooming to the 5:20 pm ferry in Horseshoe Bay to head over to the Sunshine Coast. 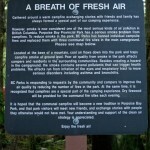 We were in Sechelt just after dinner-time and checked in at the Porpoise Bay Provincial Campground – what a gorgeous and serene spot. 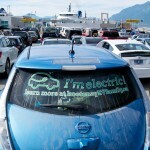 One electric car in a sea of gas and diesel guzzlers. Wouldn’t that ferry look so much more pleasant without that sooty plume, not to mention without the associated fumes, noise and vibration?! 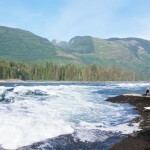 This is the view up the Howe Sound as you leave Horseshoe Bay. 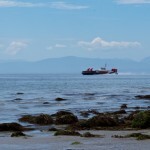 The next few days in Sechelt were really fun! 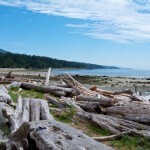 Life with the DCFC was awesome, we would travel around to see the sights within about a 40 – 70 km radius of Sechelt each day, charging for around 20 – 30 minutes in either the morning before we headed out or evening after we got back. 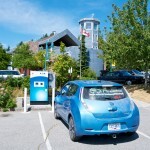 The DCFC in Sechelt is centrally located near a number of civic buildings, a mall and close proximity to downtown, so we typically had something we needed/wanted to do for those short charging sessions anyways. 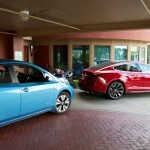 As an example, going in to the grocery store to grab something to cook up for dinner and breakfast the next day meant that the car was finished charging before we were done shopping. 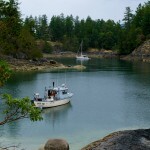 The farthest afield we went was Egmont to see the Skookumchuk Narrows and to check in at the SCH unit at their visitor center. 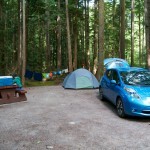 We Quick Charged at the Sechelt DCFC 5 times during our 4 day stay. 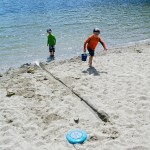 There are an amazing amount of freshwater lakes scattered around the Sunshine Coast – we went to a semi-hidden regional park and enjoyed the beach for an afternoon. 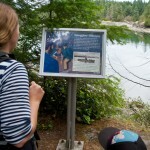 There are two SCH units located outside the Egmont visitor center. 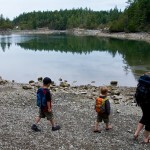 We topped up while hiking into Skookumchuk Narrows. Pretty amazing standing waves here! We watched for a good half hour – along with a dozen or so other people. Yep, they are quite big. Cedric found the CHAdeMO connector to be a bit of a bear to handle (and honestly I find it a bit awkward too, though apparently the newer CHAdeMO chargers are easier to use) – the Supercharger version really looks and handles the most elegant of the various standards. Maybe all manufacturers will adopt their connector?? Planned n/a! n/a! n/a! n/a! n/a! 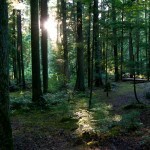 We finally had to leave the Sunshine Coast to start the journey home on Friday morning. We had some time to kill before we could stop at Grin Technologies at 10 am to get a test-ride on an electric assist Xtracycle Edgerunner, so we stopped in downtown Vancouver to check out a few places I had wanted to take Marley (no not shopping stores actually, one was a café and the other a smoothie bar!) 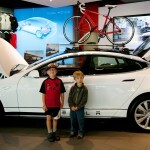 Along the way we stumbled on the Granville Tesla store… drool! 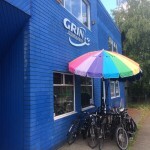 We spent quite some time driving around and around and around the block(s) trying to find somewhere to park near Grin – the employees there get 1st class parking (provided they commute by bike, which I’m sure most do! ), otherwise this is a good example of why more people need to get out of their cars and travel in a different fashion when and where possible. Anyways, I spent quite some time (way more than I had planned on) talking to the shop guys and checking the bike out. I went away pretty impressed and ended up buying a kit within a week of being home for our Edgy. We came downtown to try and find a Sun Country Highway charger to check-in for E-mazing race points, but it was in a parkade that was incredibly expensive… but we happened to find a parking stall one block on. We had some time to kill before we could stop at Grin Technologies to sample their e-bikes, so headed out to browse. 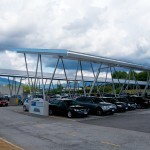 We had two other stops to make prior to leaving Vancouver, one was at BCIT to see the Solar Canopy, the other was IKEA. 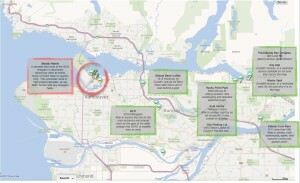 BCIT has a really interesting pilot project / research project that started a few years ago and continues onward. 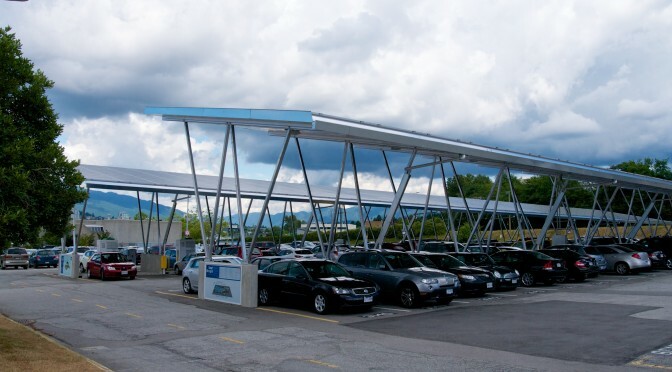 They have a fairly large solar array that is arranged over a few rows of parking stalls that is linked directly to BCITs ‘micro-grid’ and also has a battery back-up to store excess solar energy for later use. As part of the project, a number of Level 2 and DCFC Level 3 stations are included. The DCFC’s aren’t part of the public network so do not show up when you search for them on PlugShare, although the Level 2’s do show up. 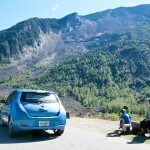 I had met one of the key members of the team (kcarmich on the mynissanleaf forum) that brought this pilot project to fruition, who also happens to have one of (if not the) longest running Nissan Leaf in BC or even Canada. A great resource for all things EV, he showed me the station and got us hooked up for a DCFC top-up from pure solar energy! We left BCIT just before 1 pm and headed for IKEA for a quick trip to get a few things (lampshades and some magazine holders, that kind of thing). 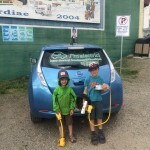 IKEA did not have a charger yet, so I dropped Marley and took the boys to a nearby SCH charger for another check-in for the E-mazing Race at the Colony Farm. 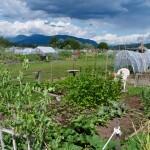 I didn’t really know what to expect, but we found a cool community garden where we stopped for a snack. We got caught up in what we were doing so we were late in getting back to pick-up Marley from IKEA and finally got on the road out of Burnaby by 2:30 pm. I still hadn’t registered us for the toll bridge, so after a long wait to get through New Westminster to get over the Pattullo, we ended up in a virtual parking lot on the freeway anyways leaving Surrey. Gah. Leaving Vancouver on a nice Friday afternoon, hadn’t really thought that one out!! 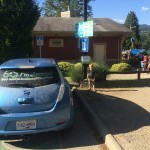 PlugShare was still showing the Ecodairy DCFC as offline, so we decided to head to Yarrow (between Abbotsford and Chilliwack) to charge up and to see the eco-village. It turns out the charger was a bit tricky to find, but eventually we did. We were all pretty spent after our day of getting through Vancouver, so we just plunked down right where we were and ate whatever leftovers we had left in our cooler. 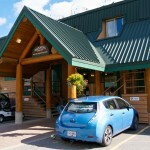 I had optimistically planned for us to arrive at Manning Park Lodge at around 3 pm and to charge to full over night – with the Ecodairy still down, we knew that we had at least an hour extra of charging, plus just getting out of Vancouver had added many extra hours, so we didn’t leave Yarrow until 6 pm or so and arrived in Hope knowing we had to charge to 100% so that we would have a hope of leaving Manning Park at a reasonable hour the next morning to get back to Princeton (Level 1 charging really is a drag, BUT, absolute range-anxiety isn’t that big of a deal when you know that you always have the deuce in your back pocket of being able to charge at pretty much any household outlet you come across). 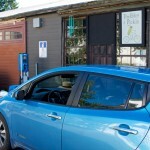 This charging stop did drag on a bit, especially with frayed nerves after the Vancouver Friday afternoon experience. I took the boys to the park to play some soccer and Frisbee (my favourite disc broke on us after many years of faithful service!) while Marley went for a walk to the grocery store for some vittles (and some blessed rest from the kids haha!) As night started to fall we moved into the Blue Moose (a great café), which is located right across from the SCH charger at City Hall. As an aside, Hope now has a DCFC online as of August 2015; this unit would have shaved about 2 hours off of our trip in each direction. 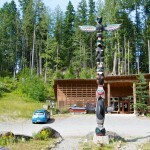 We finally left Hope at 10 pm and arrive at Manning Park Lodge around 11 pm. Leaving for Princeton the next morning, we didn’t quite have a full battery after arriving so late the night before and only having Level 1 available (though that should be changing soon I think; I was told that Manning Park would get a Level 3 in the next several months). We did however have plenty of energy to get to Princeton, since it is largely downhill, so we got going at the early hour of 9:15 am. (Sense a trend here?) We wanted 100% prior to leaving Princeton, and we arrived with 40%, so we had about 2 hours to check out the town further. 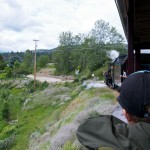 This time we crossed the highway towards the big caboose you can see near the edge of downtown with plans to walk on the Kettle Valley Rail Trail to the Booster Juice, a kilometre away. Well, the kiosk at the caboose has all sorts of interesting information about the area! 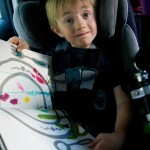 We read for quite some time, wandered to the Booster Juice to get a lunch, then headed back to read some more! That was enough to take up the 2 hours, no problem. 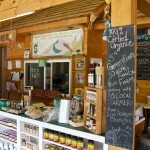 Travelling through the Cawston region on our way to Osoyoos yielded at stop at a purely organic produce stand (Hawker’s Organics), and a strawbale winery (Orofino). I really like this area. If I were ready to retire I sure would consider this area. 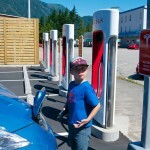 We hung out at the beach in Osoyoos, then tracked down a few more points at SCH chargers at local hotels (found a Tesla at one!) to try and get to 100 points for the E-mazing race (succeeded). 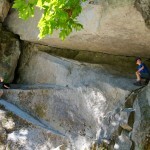 This time in Princeton we decided to walk along the KVR to get to the Booster Juice. There is a really informative kiosk right near the caboose on the side of the highway that we ended up spending quite a bit of time at, so between that and getting our smoothies the car was ready to go again before we were! 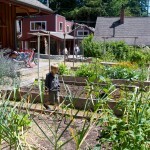 Orofino is a winery that features a strawbale building. I’ve been interested in strawbale buildings for over a decade now and Marley and I dream about building one at some point in the future. I haven’t seen too many though, so make a point to stop and see them when I can. The views as you leave Osoyoos to head up to the Anarchist Summit towards Rock Creek are pretty amazing – the light was great so I had to stop for photos. 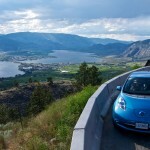 Between having to charge longer in Princeton (due to the aforementioned Level 1 charger at MPL and not having a full charge leaving in the AM), plus an hour of extra stops in the Cawston region, we were running 3 hours late leaving Osoyoos. 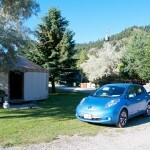 We jumped over the Anarchist Pass to the Kettle River RV Park again (who were nice enough to let us charge on our way home since we stayed there on our way out) and plugged in. Slight wrinkle this time though, they put us in a stall with an RV that was plugged into the 120V/30A circuit already. 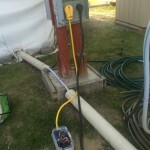 Some of the posts in this RV park are wired with 240V/50A as well as 120V/30A, so we plugged into the 50A circuit. I wasn’t really sure what total power would go to the post though, and sure enough when the RV’s A/C came on 20 minutes into our charge, it tripped our 50A breaker (though strangely not his!) Our Open EVSE allows us to dial down the amperage, so I just turned it down to 20A until his A/C turned off, then I cranked it back up to 30A. We only needed 45 minutes of charge instead of the originally planned 1 hour 30 minutes, so we ended up in Grand Forks for the night a bit after 8 pm. 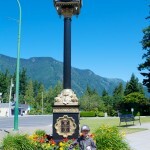 The final day of our journey had us going from Grand Forks, to Rossland, then home to Nelson for about 2:30 pm. We actually got on the road EARLY for once, by almost an hour! 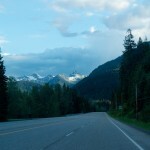 Traffic was really light, and I got to thinking that we might actually be able to make it home to Nelson in one shot by travelling through Castlegar instead and driving slower (similar to what I did in Part 3 of my February 2015 Kelowna trip). We were able to get up the Paulson safely doing 50 km/h and once we got to the pass, we sped up to about 80 km/h for the descent into Castlegar. 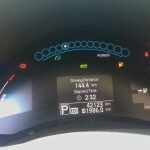 From there we were able to travel at the regular posted speed limit and arrived home with 11% after 145 km of travel and 1,600 m of elevation gained/lost for an efficiency of 7.8 km/kWh and 18.5 kWh of energy used. 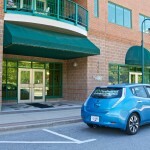 The larger capacity Leaf arriving this fall (with 30 kWh instead of 24 kWh, nominal) should be able to do this trip fine, and the next generation Leaf (estimated 40+ kWh) arriving next fall should be able to do it no-sweat! 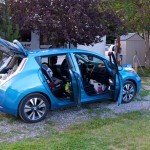 A successful road trip in our EV with the whole family. 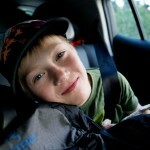 We travelled 1,986 km over a period of about 10 days – though we spent 5 of those days staying in largely the same spot. 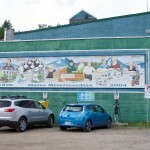 Electricity cost on this trip was $0; BC Hydro has motioned that a reasonable rate for a host municipality for a Level 3 DCFC would be $0.35/kWh, so in future I might expect this trip to have cost us about $100. 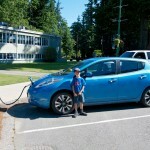 Compared to a similar gasoline car, we avoided using 150 L of gasoline, avoided emitting ~350 kg of CO2, and saved $187.50. Since the trip concluded, two new DCFCs are up and running in Hope and Penticton (we just used the latter on a recent trip to the Okanagan and it is a dual-standard unit!). We should see several more up and running by mid-2016. 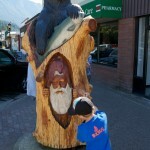 I’m not sure what it is about the hardware being installed for the DCFC rollout in BC, but it sure seems glitchy. Casually browsing the comments section each DCFC in BC on PlugShare in the last few months has showed a number of the stations going offline for a week or two while some critical part or software glitch is ironed out. 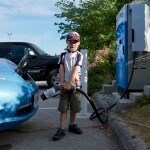 This has to get fixed before the general public will accept EVs as a mode of transport. I’m sure it will get fixed, but I can’t help but think that installing only one unit at each location has done a disservice to the EV adoption movement by making the early DCFC network notoriously unreliable. The odds of two stations going offline at the same time are quite low and would have avoided this problem entirely at a pretty low incremental cost (when you consider that the majority of the cost to install a DCFC is in soft-costs such as engineering, civil work such as trenching/repaving, electrical circuits, etc). Again I’ll state that Tesla has done it right with multiple bays installed in each site independent of each other and a no-fooling-around method to use them (show-up and plug-in!). The odds of having power to the entire site failing are very small, so having multiple independent units eliminates most, if not all, of the reliability issues that are possible. 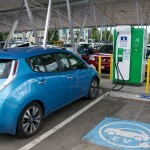 The Society of Automotive Engineers (SAE) and vehicle manufacturers (GM, Ford, VW group mainly) did the public a disservice by dragging their heels on standardizing the SAE Combined Charger Standard (CCS) plug/protocol while the CHAdeMO style DCFCs were deployed in scores around the world in the early 2010s. We seem to have moved past that now with most charger vendors offering multi-standard DCFC units (Penticton was installed as such). 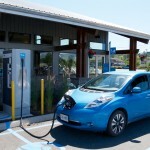 Most of the DCFCs in BC are currently CHAdeMO only, since when they were installed, that was the only DCFC standard and charger available, and EVs sold at the time only used CHAdeMO (the Nissan Leaf, Mitsubishi i-MiEV). 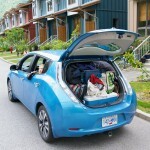 In 2014, cars were finally released that utilized CCS (Chevrolet Spark, BMW i3, VW e-Golf), but these cars make up only tiny numbers in Canada at this point. 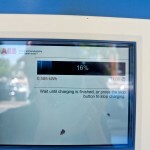 The Tesla Model S can use their proprietary Superchargers with their own connectors, plus Tesla sells an adaptor that allows them to connect to CHAdeMO chargers as well. 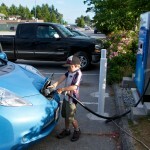 Once a reliable DCFC network is deployed across BC, I can really see EVs taking off for single-car families; especially with the next generation of longer-distance EVs arriving in 2016/2017. 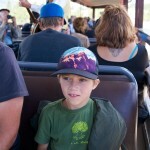 Travelling on the DCFC network was really similar to what we would do in a gas car. In the meantime, for our family, we actually enjoy travelling to new (or favourite) places even if Level 2 charging is all that is available since we enjoy driving our EV better than our gas car; and more importantly, feel better about our travelling knowing that we are doing so with less impact on the environment and with less of the myriad of social issues that gasoline consumption causes (e.g. resource conflicts). As an important side note, we are learning more about each gem of a small town as we travel through it and the history of each area. We’ve been able to travel these routes at typical highway speeds in the summer, though I would not try these routes in winter with today’s short-range EVs. Wait for the next generation with an EPA-rated range of over 200 km before trying these mountain passes with 130 km distances in mid-winter. Finally, if you are a two-car family right now and have one car that commutes more than 20 km a day, you should get on the EV bandwagon NOW! 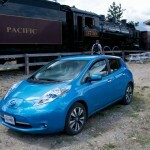 Buy a great used EV for $15k and start enjoying all the benefits of EVs now. Great report! Read it all with interest – OK, skimmed the graphs for now! You seemed to have timed your trip to miss all the smoke too! It’s very encouraging to read how much power is re-gained on descents. 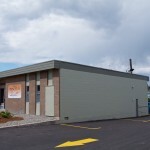 Good to know around town and for any trips out of Nelson in any direction. 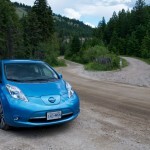 I’ve been researching the Leaf more lately and it sounds to be the best choice for an EV with a good track record of innovation and improvement. Teslas are nice but I can’t help thinking they are the muscle cars of the EV age – they don’t overcome physics and still require a lot of energy to haul all that weight around. 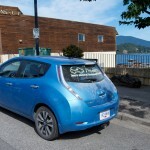 Until it’s all solar energy it’s only “pale green”… Thank you for taking the time to write and photograph and calculate! 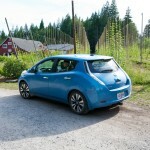 Yes the Leaf is ballpark 20% more efficient than a Tesla – as you say, physics! The BMW i3 is even more efficient than a Leaf, but it is quite expensive and uses a lot of carbon fibre. I’m not sure what the final verdict is on recycling of carbon fibre vs regular steel and aluminum. Previous Previous post: Say hello to our electric Edgy!